Christmas and the world of cinema: two things that go together like mincemeat pies and mulled wine. There are few categories of film which have captured the imagination of young and old for so many years, or which have brought with them such nostalgic charm and warm sentiment. But what is it about the Christmas movie that has proven to be so creatively adaptive over the years, and why has the genre remained so perennially popular amongst audiences all across the world? This new study charts the evolution of the Christmas film, starting in 1945 with a discussion of Leo McCarey’s The Bells of St Mary’s and continuing up to the present day with Robert Zemeckis’s 3D version of A Christmas Carol in 2009. From the silver-screen magic of It’s a Wonderful Life and Miracle on 34th Street to the madcap seasonal comedy of Home Alone and Elf, by way of White Christmas and Black Christmas, this book considers a wide selection of some of the most enduring festive movies from the past seven decades. With a detailed exploration of each film’s themes and cultural influences, The Christmas Movie Book also features a comprehensive timeline of key works in the genre and examines why it is that these well-loved classics continue to enrapture generations of moviegoers. The Christmas Movie Book examines the thematic development of the Christmas movie genre via a detailed discussion of twenty-five carefully selected films. These movies include Leo McCarey's The Bells of St Mary's (1945), Frank Capra's It's a Wonderful Life (1946), George Seaton's Miracle on 34th Street (1947), Henry Koster's The Bishop's Wife (1947), Brian Desmond Hurst's Scrooge (1951), Michael Curtiz's White Christmas (1954) and We're No Angels (1955), Billy Wilder's The Apartment (1960), Nicholas Webster's Santa Claus Conquers the Martians (1964), Ronald Neame's Scrooge (1970), Bob Clark's Black Christmas (1974) and A Christmas Story (1983), John Landis's Trading Places (1983), Jeannot Szwarc's Santa Claus: The Movie (1985), Richard Donner's Scrooged (1988), Jeremiah S. Chechik's National Lampoon's Christmas Vacation (1989), Chris Columbus's Home Alone (1990), Brian Henson's The Muppet Christmas Carol (1992), Henry Selick's The Nightmare Before Christmas (1993), John Pasquin's The Santa Clause (1994), Jon Favreau's Elf (2003), Terry Zwigoff's Bad Santa (2003), Chazz Palminteri's Noel (2004), Christian Carion's Joyeux Noël (2005), and Robert Zemeckis's A Christmas Carol (2009). There is also an opening chapter which summarises the history of early Christmas films distributed between the silent movie era and the Second World War. 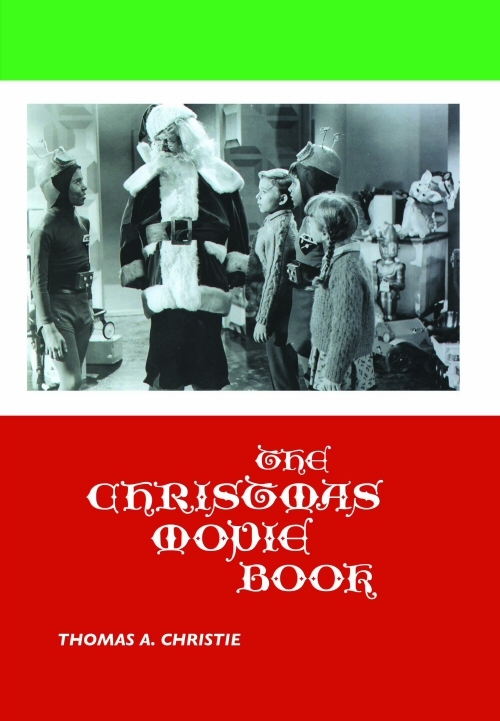 Additionally, the book contains a detailed filmography with production credits, bibliography, illustrations and reference notes, as well as a timeline of the major Christmas films which were released in cinemas between 1945 and 2009.
Who doesn't love a good Christmas movie? I know that I always have, and that's why I was delighted when Crescent Moon Publishing accepted my new study of the genre for publication. Although several other books had celebrated many aspects of Christmas films in the past, I was really eager to consider exactly what it was about this category of film that had established it as such a popular and enduring mainstay amongst audiences. Starting with the golden age of the Christmas movie in the period immediately following World War II, I discuss in detail the prominent themes which were raised in films of the genre at the time, and then examine the way in which these themes were repeatedly re-evaluated, subverted and ultimately reinforced throughout the decades that followed. The study looks into the wilderness period of Christmas films in the sixties and seventies (when the genre's cinematic output was momentarily eclipsed by the prolific production of festively-themed TV features) through to the eighties theme of incompatibility between altruistic Christmas goodwill and the age of high capitalism, the nineties celebration of family and community, and the postmodern concerns raised by the many festive films of the nougties. Although the book specifically explores the themes of twenty-five individual films between the mid-forties and the beginning of the new millennium, many other movies are also discussed in the course of the study as the seven decade period between the genre's golden age and the present day is surveyed and considered. The Christmas Movie Book received its official launch with a special 3D presentation at the Stirling Smith Art Gallery and Museum in Stirling, Scotland, on Thursday 1st December 2011.